An in-depth study on the jazz guitar style of Pat Martino. One of the most original of the jazz-based guitarists to emerge in the 1960s, Pat Martino made a remarkable comeback after brain surgery in 1980 to correct an aneurysm caused him to lose his memory and completely forget how to play. It took years, but he regained his ability, partly by listening to his older records. Martino began playing professionally when he was 15. He worked early on with groups led by Willis Jackson, Red Holloway, and a series of organists, including Don Patterson, Jimmy Smith, Jack McDuff, Richard "Groove" Holmes, and Jimmy McGriff. After playing with John Handy (1966), he started leading his own bands and heading sessions for Prestige, Muse, and Warner Bros. that found him welcoming the influences of avant-garde jazz, rock, pop, and world music into his advanced hard bop style. After the operation, Martino did not resume playing until 1984, making his recording comeback with 1987's The Return. 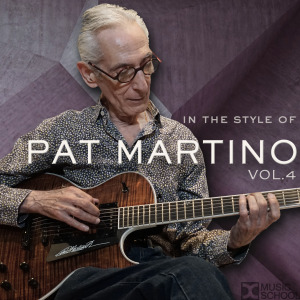 Although not as active as earlier, Pat Martino has regained his earlier form, recording again for Muse and Evidence; he later signed with Blue Note, issuing All Sides Now in 1996, followed two years later by Stone Blue and in 1998 by Fire Dance. In 2001 Martino released a live album recorded at Yoshi's in California. Two years later he teamed with saxophonist Joe Lovano for Think Tank. Remember: A Tribute to Wes Montgomery appeared on Blue Note in 2006.